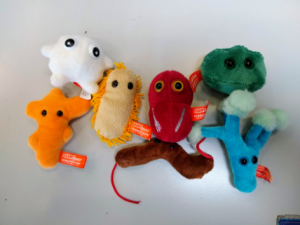 Fizz Pop Science Club – Snotty Science – Microbes! In this week’s science club we looked at microbes. After discussing what a microbe is, we looked at how microbes interact with the human body and the fact that scientists now believe over half of the cells in our bodies may not be human! We then examined some microbes and a few of our defences against them. Meet Athletes Foot, Stomach Ache, Diarrhoea, Bad Breath, Flesh Eating Disease, Penicillin and White Blood Cell. We also made slime. Making slime gave us an opportunity to illustrate how our body can use mucus to protect us from germs and also to gain an understanding of how chemicals can react to create something entirely new.